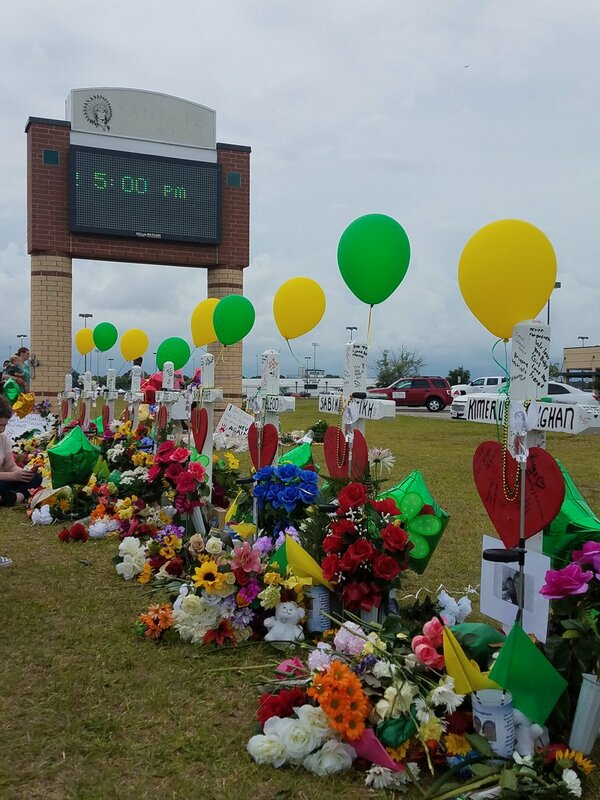 Update May 29, 2018 —Students returned to school today with increased security measures in place and signs of love and support from the community, schools outside of the Santa Fe, Texas school district. Graduation is Friday, June 1st. 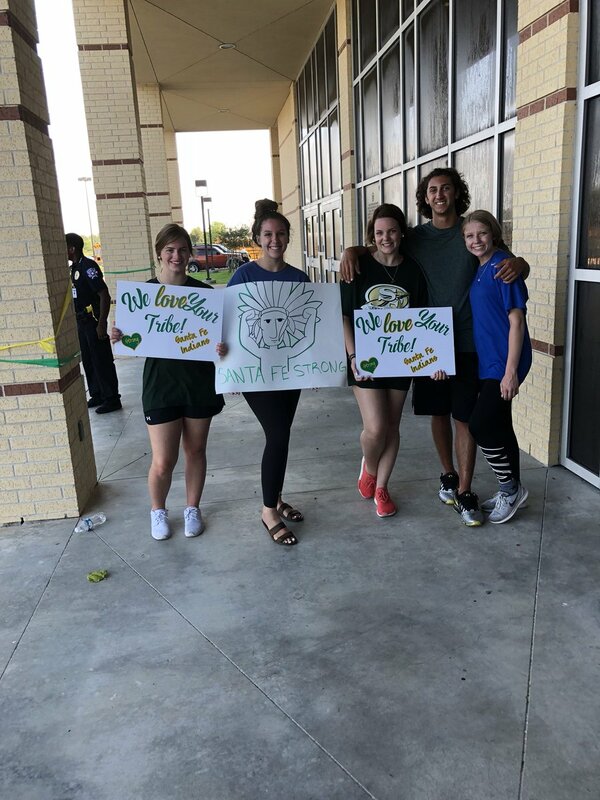 As the healing goes on, the Santa Fe High School community continued final goodbyes to the 8 students and 2 teachers who were shot and killed one week ago. 13 people also were wounded when a classmate, 17-year-old Demetrios Pagourtzis opened fire Friday morning, May 18th during a first period art class. Pagourtzis, the alleged shooter, remains in the Galveston County jail on capital murder charges. A funeral service for 64-year-old Cynthia Tisdale was held at Bay Area Church in League City, Texas today. The art room teacher’s aide worked 2 jobs to pay medical expenses for her ill husband. Services for 15-year-old Christian “Riley” Garcia were held this morning at Crosby Church in Crosby, Texas. Garcia blocked a door to the art class to protect the other students from the gunman, his pastor told CNN. The 2 p.m. visitation and 4 p.m. funeral service for 17-year-old Christopher Stone is this afternoon. Stone, a football player, tried to escape the shooter, but couldn’t. Stone went into a closet in the first period art class and held the door shut for the other students until he was shot through the door. His sisters told CBS News their brother was funny, adventurous and selfless. Stone’s family is suing Pagourtzis’ parents for wrongful death. On Saturday, May 26th, services for student Jared Black will be held at Aldersgate United Methodist Church in Santa Fe, Texas. On Tuesday, May 29th, services for teacher Glenda Ann Perkins will be held at Forest Park Funeral Home in Webster, Texas from 4:30 p.m. – 7 p.m.
Santa Fe High School and March for Our Lives Houston students also spoke out Friday about the deadly shooting at Santa Fe High School during a live-streamed news conference on KPRC-TV. “It’s so important that none of us are trying to take your guns away,” said Bree Butler, a Santa Fe High School student whose father owns guns and locks them away. “They’ve never been a danger to me,” she added. “It’s so important because if we can pass laws to make it mandatory for gun owners to lock their guns in a safe, we can save children’s lives and we can make sure that nobody goes through the pain and suffering we’re going through right now,” Butler said. “If your Congressman does not believe in this, vote them out. Vote in November. It’s the most important thing you can do,” Butler said. Santa Fe High School students are scheduled to return to class on Tuesday, May 29th after the Memorial Day weekend. This entry was posted in Harris County News, Houston News, National News and tagged Santa Fe High School, Santa Fe High School Texas. Bookmark the permalink.